Using the most advanced technologies were printed with precision all the road network of the island, the distances in kilometres, all the archaeological monasteries, churches, spaces and castles which exist on the island; beaches of course and the roads which lead to it, altitudes of the tops, paths, toponymies, headlights, the airport, and a lot of other informations. 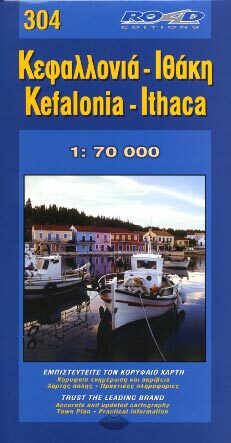 The most characteristic information on the history, the most important sites to visit, the beaches and the current face of Kefalonia et Ithaca, are described in the form of short texts, in Greek and English, at the back of the map. Green color distinct for the picturesque roads on the island as well as a complete table from all the hotel on the island, with information and telephones and a plan of the town of Argostoli, with precise indication of roads, pedestrian roads, the places, the two castles, the temples, the services public, the central banks, restaurants, and road axes.